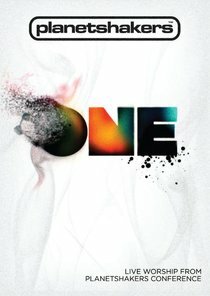 ONE is the fresh new praise and worship album from Planetshakers. For 12 years Planetshakers was a youth conference held in different cities around Australia. In April 2009, all generations gathered together in Melbourne for Planetshakers Conference, ONE. Recorded over four days and nights at Hisense Arena, this album captures the sound of all generations uniting with ONE spirit, ONE heart and ONE voice. We saw thousands of worshipers join together with one purpose: to encounter God. Tracks include praise songs 'Get Up', 'No Compromise', and worship anthems 'Like a Fire' and 'Lift You High'. As you experience the praise and worship on this album, we pray a fresh fire will be ignited in your heart. Also included, Planetshakers Conference 2009 Opening, Preaching Footage from John Bevere, Glen Berteau, Reggie Dabbs, Russell and Sam Evans, as well as Conference Highlights and Interactive Worship. The 21st album for Planetshakers, ONE will surely stir your spirit to hunger for more of God. Also available, Resource Pack (Split Trax and Digital Music Book). - Publisher. About "2009 One (Limited Edition Cd/dvd)"
Customer Reviews For "2009 One (Limited Edition Cd/dvd)"
I usually love Planetshakers but I didn't really like this album because it was quite techno-y. I bought it however because I loved 'Holy Spirit Come'.